How to Paint a Realistic Painting with Goauche - "Hamburger"
In this lesson, we'll create a realistic painting of a hamburger. We'll use gouache as our primary medium. Gouache, pronounced "gwahsh", is opaque watercolor. Typically, when traditional watercolor is used in a painting, transparent washes of color are applied and the artist is forced to rely on the white of the paper for lighter values. With gouache, opaque applications can be applied and lighter values can be developed by adding white in the mixture. This means that goauche can be used as other opaque painting mediums such as acrylics or oils. But, since gouache is a form of watercolor, it can also be used in the same manner as traditional watercolor by thinning the medium with water. Not only is gouache versatile enough to be used with opaque applications or thin washes, but it also has the ability to be reactivated with water. This makes it truly unique. Acrylics and oils, once dry, cannot be manipulated. Gouache, however, can be manipulated by adding water with a brush, even after it has dried completely. This characteristic provides the artist complete control over the development of the painting. A notable drawback of working with gouache is that is dries a bit lighter than it is applied. This makes matching colors that have dried a bit of a challenge. Goauche can be applied with any type of brush, but most prefer working with brushes specifically designed for watercolor painting. For this tutorial, two different brands of gouache are used (Winsor and Newton's Designers Gouache and Reeve's Gouache). There is a great difference in price between the two brands. While the quality of the Winsor and Newton paints is noticeably better, the Reeve's paints are quite capable. We'll start the process by drawing the contour lines of the hamburger with an "H" pencil on 140lb coldpress watercolor paper. Just the contour lines are drawn and no shading or value is added. We'll address each section of the hamburger individually, developing them fully before moving on to the next. We'll start with the bread. A brown is mixed by combining Permanent Green and Primary Red and then lightened with Titanium White and a bit of Primary Yellow. A touch of Yellow Ochre is also mixed in. The entire shape is first painted in with the local color. Lighter versions of the color are applied over the top on the lower portion of the top bun and the upper portion of the bottom bun. Water is added with the brush, reactivating the color to smooth transitions of value and color. The top portion of the bun is gradually darkened before adding a few highlights on the top edge. The values on the bottom bun are also developed further. Lighter textural marks are applied and a few shadows are added on either side. Sesame seeds are added to the top bun by painting in solid shapes of color with a mixture of Titanium White and Yellow Ochre. Indications of shadow are added underneath and lightly blended with water. The local color of the tomato is added with a red mixture created by combining Primary Red and Brilliant Red. The values are then developed using darker and lighter versions of the local color. After the tomato is complete, the local color of the cheese is added. A mixture of Primary Yellow and Medium Yellow is used. The darker and lighter values of the cheese are added and then blended using a bit of water applied with the brush. A dark to medium brown is mixed and applied to both pieces of beef. Over the top, several layers of lighter versions of this color are applied. Some of the variations are more concentrated with Yellow Ochre, Burnt Sienna, or Primary Red. Next, we'll develop the extreme values on both pieces of beef. Much darker values, created by mixing Ivory Black, are added on the top and lower portions of each piece. A liberal sprinkling of highlights are added near the center portion of each patty. Darker indications of pepper are added to complete the meat. The local color of the lettuce is mixed using a combination of Titanium White, Leaf Green, and a touch of Permanent Green. The entire shape of the lettuce receives this application of color before adding a bit of yellow-green in lighter areas. The values of the lettuce are then developed by adding darker versions of the local color in areas of shadow and lighter versions in areas of highlight. A few subtle indications of the veins of the lettuce are added and the highlights are lightened a bit further, especially around the edges of each leaf. A few of the highlights on the tomato are toned down with a bit of water before adding the cast shadow underneath the burger. A mixture of brown, Ivory Black, and Primary Blue are used for the shadow and a bit of water is applied to pull out the color, allowing it to bleed slightly. 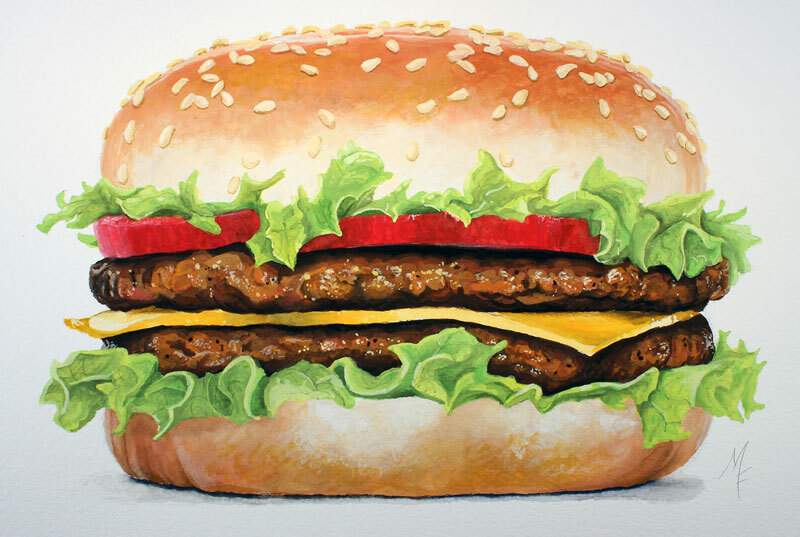 Now our realistic painting of a hamburger looks good enough to eat. Hungry?